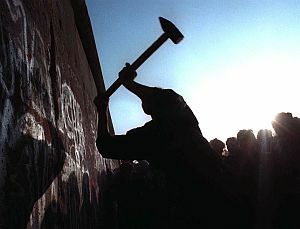 Most of the world’s media see the fall of the Berlin Wall in simplistic terms. They write that East Germans, who could no longer tolerate the Soviet occupation, embraced the rich West. But little, if anything, is said about the role of Mikhail Gorbachev and Russian democrats. Was it, in fact, a clear victory of the Western civilisation over the Eastern barbarians? The situation was much more complicated. The reunification of Germany in 1989-1990 would have been impossible without the goodwill of the Soviet Union’s leadership and the people who could influence the country’s policy through the first freely elected Congress of People’s Deputies in 1989. In the early autumn 1989, the leaders of West Germany and East Germany could not imagine that their countries would reunite so quickly. Even the East German government’s decision of November 9, 1989 to allow its people to travel to West Germany and West Berlin without special passes was effective only “until the adoption of a new law on foreign travel”, which never happened. In September 1989, the East German authorities expressed their disappointment to the government of Hungary, a country through which East Germans were escaping to Austria, and on to other Western countries. The East German leaders even complained to Mr Gorbachev, who failed to respond. So it was Moscow who initiated democratic change in Germany in 1989, including the reunification of the two German states. Moscow’s role was at least as big as that of Western Europe and the US. It was not the East German authorities – who allegedly wanted change but feared Russia’s reaction – but Russia, where Gorbachev had launched perestroika, that encouraged East Germans to initiate democratic reforms. In short, it would be wrong and unfair to present the history of Russian-East German relations as a period of Soviet occupation and unbearable pressure. “It became clear to me during the celebration of East Germany’s 40th anniversary in October 1989, that German socialism was doomed,” Mikhail Gorbachev said at a recent roundtable, titled “1989-2009: Europe at the crossroads”. Initially, many Western countries did not want the two German states to reunite or were wary of the possibility. For example, the US approved the idea only when it had become clear that its allies would rule the united Germany. Central European countries, above all Poland and Czechoslovakia, actually feared the reunification of Germany because they still remembered what Nazi Germany did to them; and also because they had seized parts of Germany following the country’s defeat in 1945. American historian Mark Kramer wrote in the Washington Quarterly in April 2009: “In Poland, Prime Minister Tadeusz Mazowiecki and other leading political figures were so alarmed about the prospect of a reunified Germany that they publicly called for the Warsaw Pact to be bolstered and for Soviet troops to remain indefinitely on Polish (and East German) soil until the status of Germany and of the German-Polish border could be resolved.” At that time, Mazowiecki, an anti-communist politician, headed Poland’s first non-communist government. In late 1989, the leaders of the new East European regimes did not consider withdrawing from the Warsaw Pact or joining Nato. The West European and American leaders’ conservatism was also buttressed by uncertainty as regards the East Germans’ choice. Many Western newspapers wrote that East Germans, who for 40 years lived amid anti-capitalist propaganda, would again vote for the communists or their reformed successor, the Party of Democratic Socialism. The situation changed overnight on March 18, 1990, when the Alliance for Germany, an opposition coalition, won the parliamentary elections. They demanded immediate reunification with West Germany, and were supported by West German Chancellor Helmut Kohl. However, the coalition won only 48pc of the vote, which is not an absolute majority. But Kohl and US hawks had the majority in the East German parliament and could disregard the opinion of the minority. Their policies were determined that day – they would work to accelerate German reunification and integrate the new state into Nato. Moscow tried to protest against Germany joining Nato, but its partners in the US and the European Economic Community, the forerunner of the more powerful and inertia-driven European Union, refused to listen to its arguments. It was at that time that the US and its European allies found a hypocritical formula for appeasing Russia. The Nato expansion will actually expand the zone of peace and security, they said, and the closer that zone approaches Russia, the better. Nobody thought then that the “peace and security zone” would bomb Belgrade and Podgorica in the former Yugoslavia. So the actual situation differs dramatically from the benevolent statements currently made in Washington and Berlin. It can be said that German reunification was a forced and undemocratic decision that could be expected from Bolsheviks rather than Western democracies. The winner, however, is always right, and Chancellor Kohl got what he wanted, who cares how he did it? But cultural and economic losses from such decisions often become apparent only years, or even decades, later. This is probably why debates about that event have not stopped in Germany 20 years later, and old wounds refuse to heal at the intellectual and economic levels. In the mid-Nineties, Spiegel magazine asked East Germans what was better and what was worse in their former country compared to reunited Germany. The answers provided by the “Ossis”, as West Germans call East Germans, shocked many. East Germany won on most counts, including personal security, healthcare and education, and excluding only living standards. This could be the “material” foundation for the current popularity of the democratic socialist Left Party, the successor of the Party of Democratic Socialism, which has won a considerable share of the Social Democratic electorate.